Mr Donegan, a married father-of-three, was shot dead by a lone gunman as he sat in his sports car outside St Mary’s Christian Brothers’ Grammar School on the Glen Road on Tuesday afternoon. Jim Donegan, 43, was shot dead in west Belfast on Tuesday afternoon. The 43-year-old was killed as he waited to collect his 13-year-old son outside the school gates. Details of Mr Donegan’s funeral haven’t yet been released. Jim Donegan beside the Porsche sports car he was sitting in when he was murdered on Tuesday afternoon. Meanwhile, detectives investigating the murder arrested two men, aged 49 and 51, on Wednesday evening following a number of searches in the west Belfast area. Read more here. 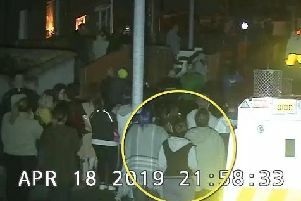 Investigating officers yesterday released CCTV footage showing the gunman walking to the murder scene and then running along the Glen Road after the shooting. See full story and video here. They have appealed for anyone with information about what happened to contact them on 101.